Born: 23 June 1843, Leipzig, Germany. Died: 28 January 1907, San Remo, Italy. C.E. 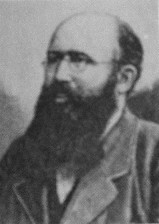 Otto Kuntze, German naturalist, started his career as a tradesman in Berlin (1863-1866) and manufacturing chemist in Leipzig (1868-1873) and became financially independent. His study of botany initially led to the publication of a flora of Leipzig in 1867. During 1874 to 1876 he undertook a voyage round the world, collecting some 2700 plant specimens. The voyage was described in Um die erde: Reisberichte eines naturforschers (Leipzig, 1881). From 1876 to 1878 he studied natural science at the universities of Berlin and Leipzig and was awarded a doctoral degree in Freiburg on the basis of his monograph on the genus Cinchona, evergreen trees and shrubs native to South America from the bark of which quinine is derived. He observed plantings of the trees in Java and the Himalayas. A monograph on the genus Clematis followed in 1885. In 1887 he went to Kew Gardens, London, to work up his plant collection for publication. The work was published in Volumes 1 and 2 of his Revisio genera plantarum... (Leipzig, 1891). His interests included palaeobotany, on which he published a book in 1884, as well as geology. Two papers by him on the origins of ancient rocks appeared in 1880 and 1885. Furthermore, several addresses, lectures and essays by him on geological topics were published in 1895. During 1891 and 1892 Kuntze travelled in Europe, North America, South America, and the region south of the Caucasus. In 1894 he visited South Africa. Arriving in Cape Town on 8 January he collected plants around the town for 11 days; then at Sir Lowry's pass and Houhoek until 31 January; travelled via Swellendam, Beaufort West and Kimberley to Bloemfontein and on to Johannesburg and Pretoria; proceeded to East London via Aliwal North, Burghersdorp, Molteno, Cathcart and King William's Town, and by ship to Durban on 6 March. In KwaZulu-Natal he travelled to Ladysmith, visited Van Reenen's Pass, and returned to Durban via Glencoe and Charlestown. Returning to Europe along the African east coast he touched at Delagoa Bay (now Baia de Maputo), Beira, and Dar-es-Salaam. The resulting collections were described in Volume 3 of his Revisio genera plantarum... in 1898. One of the new species described by him was Aloe Transvaalensis. His herbarium was acquired for the New York Botanic Garden by Andrew Carnegie. The type specimens of South African plants in the collection were reviewed by R.A. Dyer* in "Otto Kuntze type specimens of South African plants" (Bothalia, 1941, Vol. 4, pp. 181-191). Kuntze also studied algae of the genus Sargassum (Gulfweed), which are found floating in island-like masses, particularly in the Sargasso Sea of the North Atlantic. His collected papers on algae were published in 1893-1898. In 1904 he published his Lexicon generum phanerogamarum.... He was an uncompromising reformer of botanical nomenclature, publishing many papers on the topic in German, French and even English during 1893-1903, for example, "The advantages of 1737 as a starting-point of botanical nomenclature" (Journal of Botany, 1900). This paper reflects one of his controversial taxonomic practices, namely to use the first edition of Linnaeus's Systema Naturae (1735) as the starting point for naming genera, with the result that many of his names have not survived. His uncompromising attitude furthermore led to much criticism of his work. None the less several plant species were named after him. Otto Kuntze. Wikipedia. Retrieved from https://en.wikipedia.org/wiki/Otto_Kuntze on 2018-4-9.